The EcoAir DCW10 has left us in awe. It’s implementation is such a good idea and represents a reasonably new model in a long line of hugely popular, well thought out and efficient dehumidifiers by EcoAir (a trading name of Fok Trading Ltd). It sits in the ever popular ‘DC’ range between the DC12 and the DC202. We think you’ll be suitably impressed with this device, as we are, and might be surprised at just how simple, but remarkably good, the idea behind this unit is. 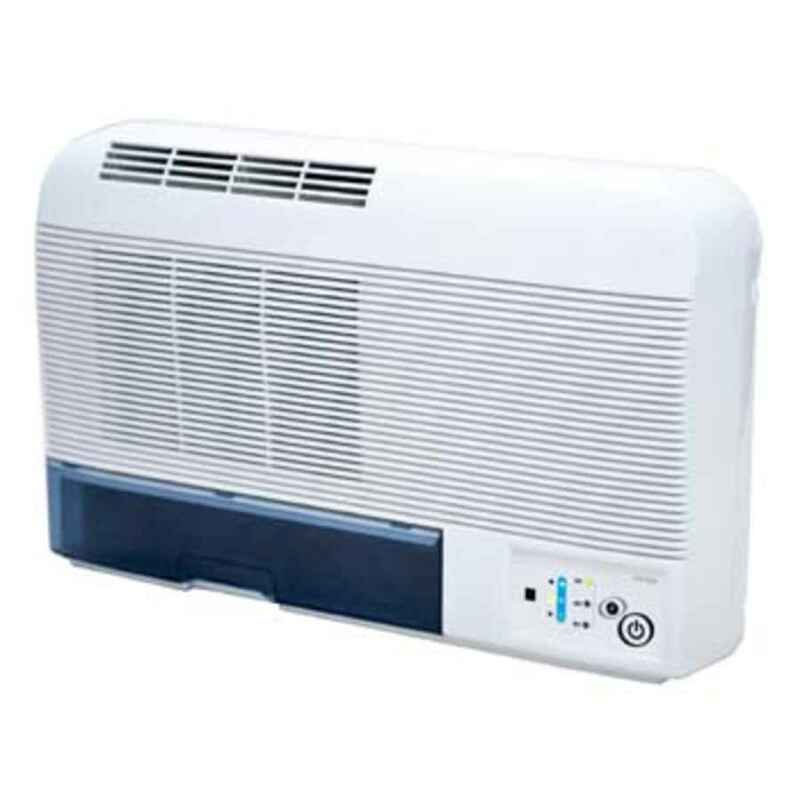 Lets begin by stating the most obvious thing the DCW10 is a wall mounted dehumidifier. The only main disadvantage this brings is that you may need someone to hang it on your wall for you and will obviously need a certified electrician to run power to the device. However, this only applies when you are installing it in your bathroom. If you wanted to use it in your office or general room in the home you can simply plug it in (it comes pre-wired with a plug already attached). The DCW10 arrives with all the required screws, plugs and a wall bracket and, for most people, with even a little bit of DIY knowledge hanging it yourself should present no problem at all. Particularly as it is much smaller than our image above makes it out to be. It is, in fact, only 17cm deep by 53cm wide by 32 high. To give you a rough idea how compact this is, the DCW10 is only just taller than foot long/30cm ruler. Although you may need someone else to help you lift it onto the bracket (once fitted to the wall) because some people might find it a little heavy at 11kg. Even if you are impressed with the size of this unit (look how discrete it is in the bathroom above) and one or two of its other cool features (more on these below) you can still use it as free standing device which can be pushed right against a wall and still operate with no problems. This is especially useful if you need it in your bathroom or kitchen but find you don’t have the room for one its larger brethren, which often need at least 20-30cm clearance around all sides to operate effectively. A removable charcoal filter is also included with the unit. These kinds of filters are called ‘activated carbon’ filters and are perfect for absorbing odours in addition to filtering dust from the air. The carbon atoms which make up the filter have been treated with oxygen, making the carbon very porous and able to absorb many different elements. However, unlike a normal filter which can be cleaned when carbon filters become ‘full’ they need to be replaced. If you’ve read any of our other reviews you will know that we are usually suitably impressed with the impressive array of useful functionality EcoAir provides on its dehumidifiers. However, the DCW10 seems rather basic providing only two main functions. Were we disappointed? No, not really. In fact this is expected because, unlike a typically dehumidifier, the DCW10 is designed to do one job – to keep high humidity rooms dry. 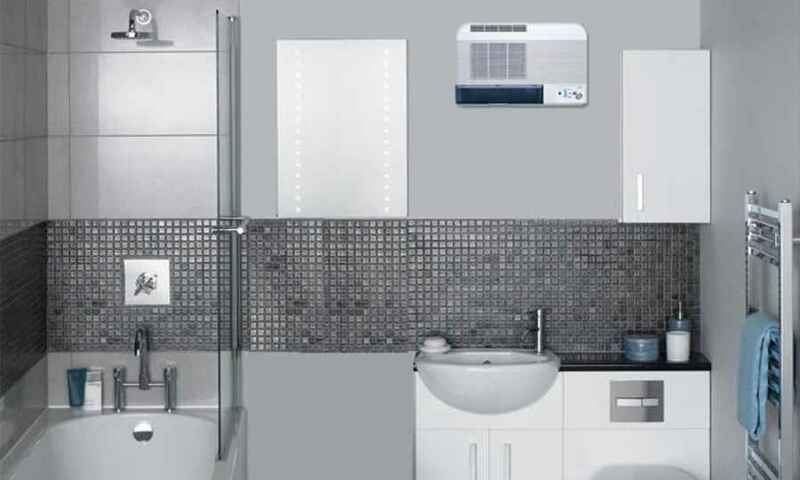 Typically a modern domestic dehumidifier can be used for anything from drying washing, removing condensation, dealing with damp and drying bathrooms after bathing etc. This naturally requires a lot of extra functions that the DCW10 simply does not need. Making it incredibly easy to use. The DCW10 can be controlled one of two ways. The first is via the simple control panel on the device itself and the second is by using the supplied remote control – which essentially mirrors the main control panel buttons. We loved the little remote! Not only is it nifty device to have and it allows you to mount your device where ever you would like it and not have to worry about reaching the controls to turn it on etc. It also means this unit can be mounted high enough to be safely out of the way when children are around. Essentially you can have the unit on continuously or turn it on and use the timer function to turn it off for you after a certain time has elapsed. You can allow it to run for 2, 4 or 8 hours – which is typical for most dehumidifiers. To give you an idea of what the unit is doing EcoAir have included a bank of 3 very simple indication lights which tell you the current state of the unit. 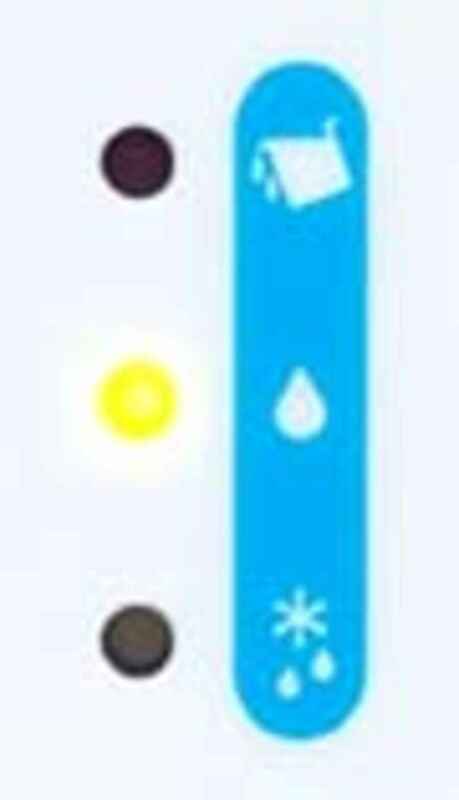 You will be able to see in a glance if the tank is full, if the unit is working and lastly if it is defrosting (more on this later). We suspect this was intentionally kept simple so it can be seen at glance from a distance. 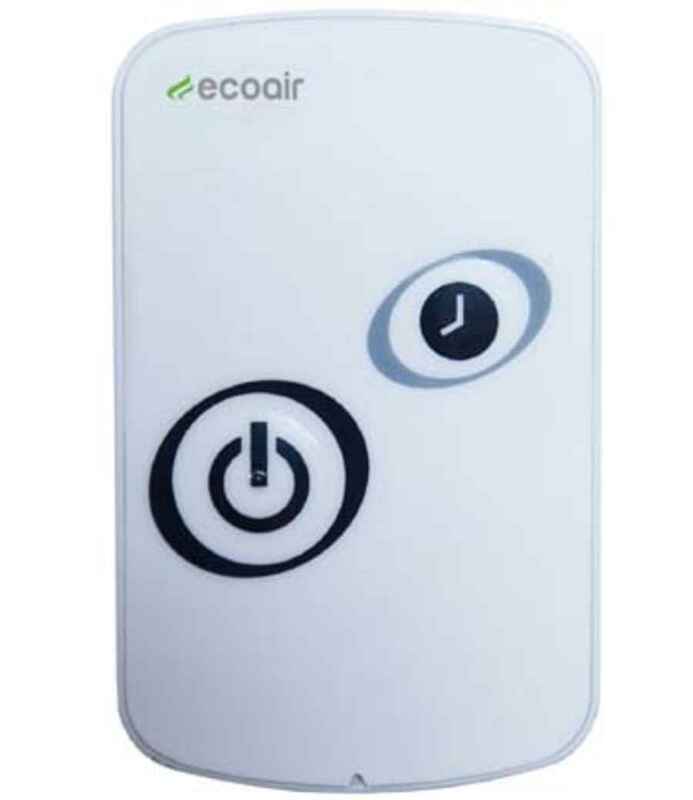 EcoAir list you can use this device in caravans, offices, bathrooms and kitchens – the usual kind of environments you would see a dehumidifier used. But, in our view, it is perfect for mounting in your bathroom or kitchen where excess humidity in the air is often a problem, causing condensation not just on the windows but also the walls. And to make sure the unit is safe to use in these typically wet environments the DCW10 comes with an IPX2 rating for the main unit. This means it can safely operate whilst in steamy rooms and is safe against the normal splashes of water that occur in these rooms – should a couple hit the unit. Even the remote has an IPX rating of 5 so you know it will be right at home if left in these rooms without worrying about it malfunctioning. Over the course of 24 hours the DCW10 can extract up to 10 litres of water at 30° and 80% relative humidity (RH). In most cases we would curb this estimate somewhat because the high temperatures and humidity quoted are based on conditions rarely found in the UK. But, in the case of the DCW10, we would have to say this is pretty accurate. Why? Because after a long hot shower the humidity level can often be over 80% and the temperature often up to 30°! And, even in your kitchen, when you’re boiling pans of water the humidity and temperature levels can shoot right up – and this is the exact environment this device was made for. The water collection tank can hold an an average(ish) 2 litres of water before it needs to be emptied. This doesn’t mean you’ll need to empty it 5 times per day! (based on 10l collection over 24 hours). After all, the unit won’t be running 24/7. But emptying the tank every day or two would be reasonable depending on the size of your household and if you’re using in your bathroom/kitchen after showering cooking. You also have the option to set the machine to continuously drain – removing the need to empty the tank at all. EcoAir has supplied a handy 2m hose which you can direct into the nearest sink. This unit is designed to operate effectively in temperatures of 5°C to 35°C. The 5°C lowest operating temperature may seem a little high when compared to some which can go down to 1°C, but this unit was simply designed to be used in warmer rooms. It also employs a slightly noisier, but highly efficient, refrigerant technology to help remove moisture from the air and operates at 42dB(A). But we do not see this as a problem because the device would be operating in rooms where you may have an extractor fan running and the noise this unit makes is only comparable to this. OK so the EcoAir DCW10 isn’t the most feature laden device we have reviewed – but we still love it. It’s simplicity and design to perform one function well has really impressed us. The simple twist of making it wall mounted was also ingeniously simple but clever. Think of the damage you could prevent in your home simply by having a dehumidifier ready to go in the problem rooms such as you bathroom – the DCW10 would be ready exactly when you need it. Helping to stop mould growth around bathroom seals and paint from blistering or sprouting that peculiar pink mould which can grow in bathrooms! I know our freestanding unit would be much better discretely placed on our bathroom wall because this is room where we typically use a dehumidifier. The DCW10 has a lot going for it and would be great for anyone who wants something discrete, yet powerful and that can be tucked out of the way to quietly do its job.